team...driven by personal integrity, trust and communication. ADvTECH provides streamlined, results-orientated consulting services in environmental compliance, site investigation, and remediation. Our staff has solid practical experience in the field of hydrogeology, groundwater, civil and chemical engineering, wastewater, and remediation. Small Business Commerce Association’s Award Honors the Achievement of ADvTECH Environmental, Inc.
SAN FRANSICO, November 7, 2009, The Small Business Commerce Association (SBCA) is pleased to announce that ADvTECH Environmental, Inc. has been selected for the 2009 Best of Business Award in the Environmental & Engineering Services category. ADvTECH is please to announce that Mr. Charles Ly has joined the company. He is a welcomed addition with specific experience in remedial engineering, site evaluation and database management. Mr. Ly graduated from California State University, Fullerton in 2012. Please join me in welcoming him to the ADvTECH team. ADvTECH's Project Team Members have named by the Alliance of Schools for Cooperative Insurance Programs (ASCIP) as a member of their team to assist with SWPPP requirements at various District facilities. ASCIP members have been quick to utilize ADvTECH in addressing the new Phase II and MS4 requirements. Also, working closely with members of the California Alliance of Schools, Business Officials on compliance issues. ADvTECH's Project Team Members continue to seek opportunities and funding under the Small Business Innovation Research (SBIR) and Small Business Technology Transfer (STTR) programs administered by a variety of governmental agencies. ADvTECH is currently seeking opportunities with both private-sector industry and Department of Energy's (DOE's) National Laboratories for collaborative or joint research projects for the development of innovative site characterization and predictive analysis tools. On-going discussions for research opportunities tap into a multi-disciplinary team of experts in the fields of 3-dimensional (3-D) seismic imaging, and contaminant-source reconstruction using 3-D plume analysis via groundwater flow and fate & transport modeling. In collaboration with Lawrence Berkeley National Laboratory and under a Phase I STTR solicitation offered through U.S. Department of Energy, Office of Science, ADvTECH staff members are engaged in pursuing the development of a parallel code version of a high performance reactive transport numerical simulator for a 3-dimensional, fully implicit model that solves large, sparse linear systems arising from discretization of partial differential equations for mass and energy balance in a porous or fractured media. Our interest is the further development of geochemical and biogeochemical phenomena in a "leadership class" computer simulator that treats the environment as an open biogeochemical reactor where chemical change is driven by the interactions between migrating fluids, solid phases and organisms. TRAINING - STORM WATER POLLUTION PREVENTION!! ADvTECH's Project Team Members can provide training to your key SWPPP staff members on the requirements of your SWPPP program. The goal of this brief awareness training is to provide site operators with a more thorough understanding of the storm water pollution issues, with awareness being the first step towards prevention. On behalf of the Norwalk-La Mirada Unified School District, a joint venture between ADvTECH and Fuel Solutions has this project team recently completing the development of technical specifications associated with UST fueling system upgrades and installation of a Compressed Natural Gas facility. To meet future state requirements, consider alternative fuels for your fleet. When you choose ADvTECH Environmental, Inc. we make every effort to provide you with superior service by completing your project on time, within budget, and to your complete satisfaction. See what a difference working with ADvTECH can make on your next project. We look forward to working with you. ADvTECH's project team has recently completed the Preliminary Endangerment Assessment (PEA) projects for two proposed school sites for the Pomona Unified School District (PUSD), Los Angeles County. The completion of these two projects, under the regulatory guidance of CalEPA, Department of Toxic Substances Control, helps PUSD to meet the growing demands for "new" school sites in their District. ADvTECH has performed a wide variety of environmental projects for various school districts...from Facility Audits and UST upgrades to evaluation of new sites under the jurisdiction of DTSC's School Property Evaluation and Cleanup Division. Mr. Michael Shiang, R.G., C.Hg. 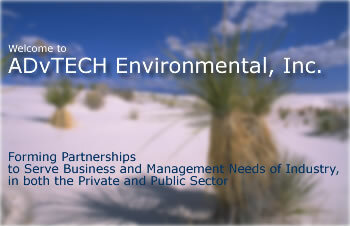 - Principal of ADvTECH Environmental, Inc. has acquired the State of California, Contractors State License Board - General A Engineering License. In addition, pursuant to the provisions of Section 7058.7 of the Business and Professions Code, the Registrar of Contractors certifies that Mr. Shiang has also successfully completed the Hazardous Substances Removal and Remedial Actions examination.